Robert Williams, though young in his career as a basketballer is referred to as a perfectionist when it comes to his games. He was selected as the 27th overall pick by the Boston Celtics during the 2018 National Basketball Association Draft. Unfortunately, William seems to be absent in most of the games scheduled for the year 2018 necessitating a lot of questions about his whereabouts. This article contains everything you should know about him. Who is Robert Williams (Basketball)? Robert Williams is a basketball player who has impressed in the court, playing the game he loves throughout his days at high school. This has earned him qualification to the NBA Draft 2018 after being ranked as a four-star recruit. Originally born as Robert Lee Williams III on October 17, 1997, at Shreveport, Louisiana, he attended North Caddo High School located in Viviana, Louisiana. William was born to Robert and Tundra Williams and he is one of two children – the other is Brittanni who majors in recreation, park and tourism science. Records have it that Robert was cool-headed when he was little but changed to be a tougher young man when his parents divorced and at that time, his grandmother was diagnosed with cancer. He has spoken openly about his poor background and is looking forward to changing the lives of his family. As days rolled by, his mom, Tundra had to quit her job to take care of his sick grannie making Robert the man of the house. On Britanni’s part, she was so devasted and unhappy with her parents and finally moved out of the house after their divorce. The family passed through a lot of hardship, but Robert always had a smile on his face with a strong belief that things would change for the best. 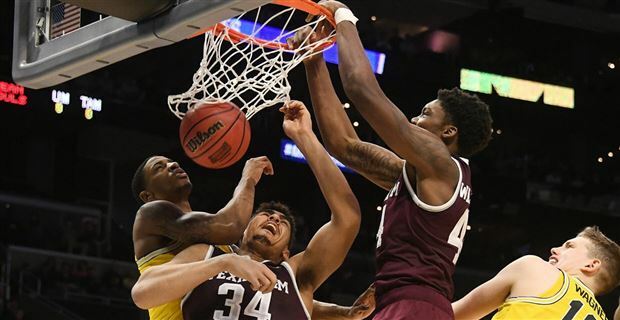 We could say that Robert Williams matured into being an adult really quick due to what he experienced as a child and decided to pour his pain into the game of basketball. He was committed to the game of basketball while at high school and later took it up in his days at Texas A&M University. The basketballer has developed strong skills in the game and was selected by the Boston Celtics during the 2018 NBA Draft. With his kind of excellence, ESPN listed him as the 50th overall in their list of Top 100 basketballers for his class in 2016. He was also recorded as one of the best in the whole of Louisiana. While in college, he was efficient in his game, recorded an average point of 11.9 points and a team-high 8.2 rebounds per game as a freshman and was later named the SEC Defensive Player of the Year. He was also rewarded with the 2nd Team All-SEC honors. Everyone who knew Robert Williams’ background history would give their support when he took interest in the NBA 2017 draft. As it was an opportunity to change the life of his family, however, the youngster believed he wasn’t ready enough both mentally and emotionally to go Pro. So he opted out and spent yet another season with his college team. At first, Robert thought he was certain about his decisions on staying back with his college team for the remaining two years of his college eligibility, however, he decided to forgo the remaining season after his team lost in the 2018 NCAA Men’s Basketball Tournament. With so many qualifications listed to his name in 2017, by the following year, a lot of sports media persons bragged about his skills and expected him to be one of the potential lotteries picks for the 2018 NBA draft, unfortunately, they were quite disappointed as he emerged as the 27th overall pick by the Boston Celtics. Robert Williams performing a dunk. After he was selected, Robert Williams was behind schedule as he joined the team late and had also missed a lot of functions. To date, no one knows the reason behind his absence throughout those periods. As time went on, he sealed the deal with the Boston Celtics as a center/forward on July 5, 2018, and was assigned to wear jersey No. 44. That same month, Robert’s career came to a halt as it was publicly announced that he was diagnosed with a popliteal artery entrapment syndrome (PAES) on both legs. Futher diagnosis showed that his case is not pretty serious, however, there are chances it might worsen. The disease in question is commonly found in athletes. It is an uncommon Pathology which often leads to claudication and chronic leg ischemia. It is often related to the knee and is caused due to congenital deformity of the muscles or tendons. Prior to him being drafted, the Bostons were aware of his conditions and still insisted on signing him. Nevertheless, it is said that Robert Williams has been playing with the condition for years but has not been this badly affected. Robert Williams was one of the play as a forward in his team with the Texas A&M. He is quite young and was drafted when he was just 20 years old. The basketballer is quite tall and stands at 6 feet 9 inches with a balanced weight of 107 kg. He also has an athletic body build. With his body frame and a 7’5.5 wingspan, he has prototypical dimensions and gives an impressive leaping ability. He has an extremely large foot and measured at 6’10” which gives him a perfect balance while making a dunk or a rebound. Robert Williams is assumed single and has publicly announced that he takes the game of basketball as his girlfriend and has decided to stay single in order to concentrate on his career.